Visiting the Christmas markets in Europe is one of my favorite things Tyler and I have done together. The holiday season tends to bring out the best and worst in humanity in the U.S. Let’s be real, it tends to bring out the best and worst in me, too. One second I’m humming “Silent Night,” sipping cinnamon tea, and quietly drafting a list of Christmas presents for my loved ones, and the next I’m slamming on the horn in a crowded parking lot, ready to throw down with a soccer mom in broad daylight. I think we can all admit that we have a materialism problem here the U.S. (myself included), and the holiday season can be intense, to say the least. We spend the entire month of December running around in the name of “holiday cheer.” We frantically get ready for parties, throw every peppermint item on the shelves of Trader Joe’s into our carts, and power-walk through shopping malls toting Nordstrom bags the size of Mini Coopers. More, more, more. Meanwhile in Europe, local vendors sell homemade goods from decorated wooden stalls while families casually stroll beneath strings of twinkling lights at Christmas markets. There’s just something so (not obnoxiously or forcibly) festive about Christmas time in Europe, and we HIGHLY recommend the trip to anyone looking for an alternative to the craziness of the summer tourist season. There are tons of markets to choose from, so I’ve decided to list our favorites in today’s post. Make sure to hit as many of these as you can if you find yourself in Europe during the month of December. Vienna may as well turn into a snowglobe during the Christmas season. While the former Imperial capital is a dream in and of itself, add in any one of the twenty Advent markets within the city limits and Vienna transforms into a winter wonderland. The markets in Vienna are all very traditional (not gimmicky) and absolutely gorgeous. Ice skate beneath the Rathausplatz in the city centre, or make your way to the lively market nestled in the Schoenbrunn Gardens. Land of Mozart and The Sound of Music, Salzburg does not disappoint in December. 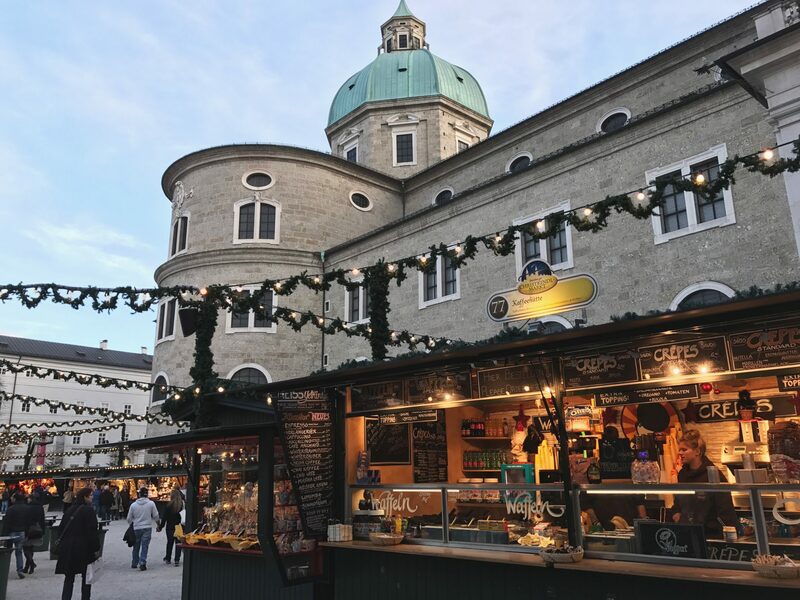 Find the main market in the picturesque and historic altstadt, or “old town.” Sip on glühwein (mulled wine, translated literally “glow wine”) and watch Christmas carolers perform on the steps of the Salzburg Cathedral. For a truly magical experience, make your way up to the fortress at sunset. There are a few vendors at the top, so grab a glass of hot cider and take in the staggering views of the Austrian Alps in Salzburg’s backyard. We passed through Munich just a few days too early last year on our road trip, but the vendors were already setting up in the Marienplatz and it looked incredible. I like to think of Munich as Disneyland for adults. The vibrant old town area provides the perfect setting to stroll and pick out an ornament for your mom. To really take it to the next level, rent a bike and cruise through the English Gardens in the afternoon to work off some of the bratwurst. This bustling university town knows what it’s doing. Freiburg sits on the southern tip of Germany’s Black Forest and goes all out during Christmas. Pregame your market visit with a Black Forest cultural staple: a dip in the thermal baths just outside the city. Then bundle up and prepare for an evening of people-watching and chestnut-snacking under the sparkling lights. Gengenbach was our favorite stop in the Black Forest. We found this tiny, storybook town virtually tourist-less (Tyler gets so annoyed when I pretend we don’t count as tourists). Check the larger-than-life Advent calendar on the 200-year-old city hall, and take some time to walk along the river outside the town square. This Alsatian city apparently hosted the first Christmas market ever back in 1570. Strasbourg, with its unique fusion of German and French culture, provides the perfect venue for market-goers to get all of their Christmas shopping done. Don’t forget that you’re in France now–ask for “vin chaud” to get your mulled wine fix. Also, don’t miss the staggering Strasbourg cathedral (we’d be shocked if you did–it’s gigantic). Just a twenty-minute train ride south of Strasbourg, Colmar is a tiny medieval town full of colorful, half-timbered houses and dreamy canals. Precarious but adorable bridges carry pedestrians through “La Petite Venise” block. It’s not hard to believe that this fairytale town actually provided Disney with the inspiration for the setting of the original Beauty & the Beast. Colmar is probably my favorite Christmas market in Europe. The food was the BEST (how many crepes is too many?) and the decorations were just over the top. Tyler and I spent a four-hour layover visiting with a friend in Copenhagen a couple of years ago, but we didn’t have enough time to see very much of the city. Since then, Copenhagen has been near the top of our list, specifically during the holiday season. The lights decorating the Christmas market were designed by the head designer at Tiffany, and we are just dying to see them in person. Did we miss any markets? Let us know your favorites below! If you found this guide to the best Christmas markets in Europe helpful, relevant, or entertaining, we’d absolutely love it if you chose to follow along on Instagram.